"People take pictures of the Summer, Just in case someone thought they had missed it"
Time Flys, Life Dies...Phoenix Rise (this album) (2015). Sorry, no matches on eBay for "Battle Buddies 4 Life (Feat. 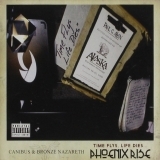 Dizaster) Canibus & Bronze Nazareth".